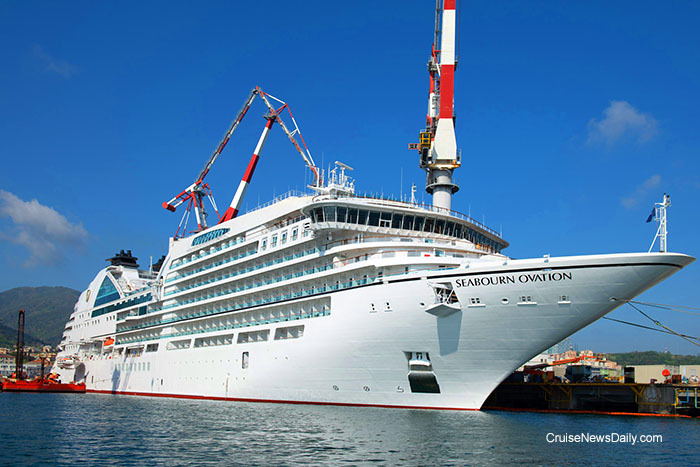 Fincantieri delivered Seabourn Ovation to Seabourn and Carnival Corp today at their Sestri yard near Genoa. The 40,350-ton vessel is the second in the Encore-class, with Seabourn Encore being delivered just over a year ago at the end of 2016. The first phase of construction of a new $150 million cruise terminal at Port Canaveral has begun with the start of demolition work on Cruise Terminal 3, one of the port's oldest cruise terminals used for day cruises and vessels just making a port. The deconstruction of the present terminal is expected to be completed by July of this year. It will be replaced with a new two-story, 188,000 square-foot, state-of-the-art cruise terminal able to accommodate 6,500 cruise passengers. Adjacent to the terminal will be a new parking garage with covered, secure parking space for approximately 1,800 vehicles. Remember the man who went on a Mediterranean cruise last February (2017) with his Chinese wife and children, and he and the kids disembarked without her at the end of the cruise? He was arrested for murdering her and has been in jail in Italy since then. Italian authorities have now released him apparently because they don't have any evidence against him. Norwegian Cruise Line broke ground today for their new dedicated terminal at Port Miami. The terminal was approved by the country board on April 10, and Norwegian wasted no time in moving forward. Construction will start May 1. The pressure is on because the terminal must be completed in time for the arrival of Norwegian's new ship, Norwegian Encore, in the fall of next year. Coast Guard watchstanders received a call from Holland America's Veendam today requesting a medevac for a 65-year-old woman who was suffering from lower leg pain. A rendezvous point was set 50 miles east of Charleston (SC). The Coast Guard sent an MH-65 Dolphin Helicopter crew from Charleston and an HC-130 Hercules fixed wing aircraft from Clearwater (FL) to support communications coverage, and they recorded this video. The helicopter crew hoisted the woman from Veendam's deck at 7:31pm Thursday evening and transported her to a hospital in the Charleston area. Video courtesy of US Coast Guard. 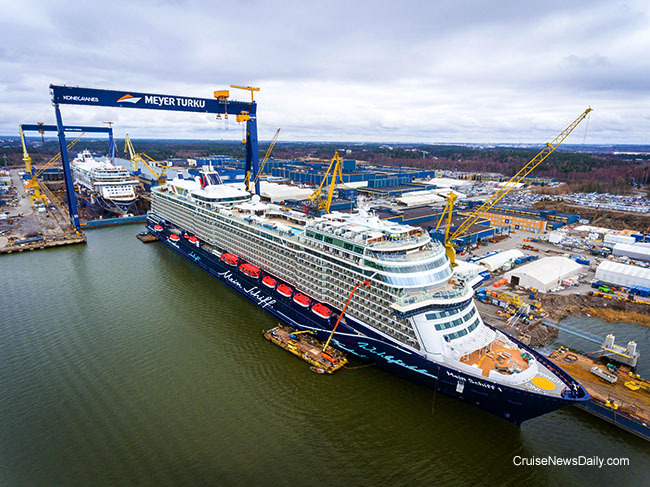 Meyer Turku delivered Mein Schiff 1 to TUI Cruises (the partnership with Royal Caribbean) today at the Finnish yard. This is the fifth ship the yard has built to TUI. 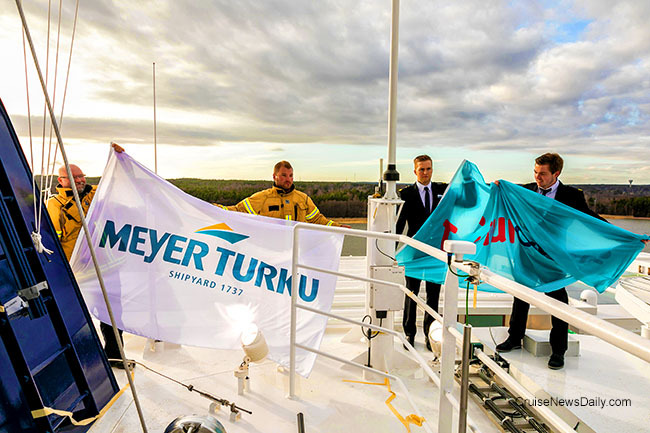 Photos courtesy of Meyer Turku. All rights reserved. May not be copied or used without express permission. When you think of expedition cruises, you don't exactly think of what Crystal has in mind for their “expedition yachts,” but then again Crystal is out to change your mind, or at least the minds of a certain segment of the market. Crystal today released details - and renderings - of the accommodations on their first expedition yacht, Crystal Endeavor, and they are stunning. The complete story appeared in the April 24 edition of Cruise News Daily. If you are the type who tracks where ships are, then you know that the 138,000-ton MSC Splendida arrived in China today to begin its season there sailing mostly from Shanghai, with several sailings from Yokohama. The line used the occasion to announce that MSC Bellissima will be deployed to Asia in the spring of 2020. Like MSC Splendida, MSC Bellissima will sail most from Shanghai, but will have a number of sailings from Yokohama. Due to the popularity of their 2019 World Cruise, which is still nine months away from sailing, Princess Cruises has decided it will again be the intimate Pacific Princess to operate their 2020 World Cruise. 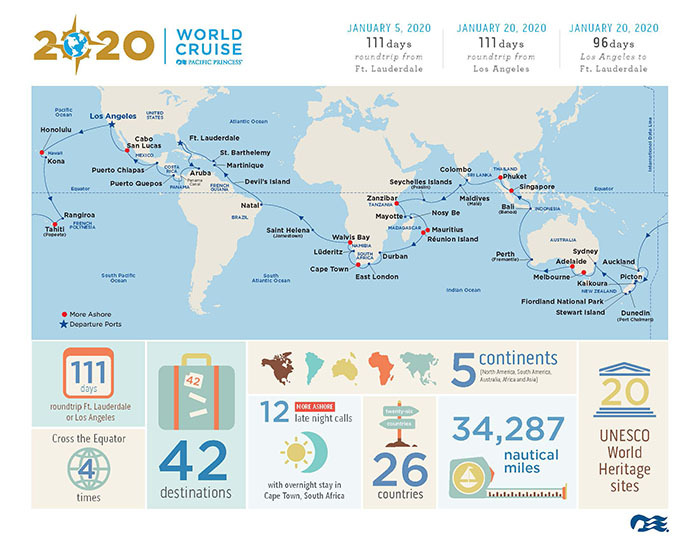 The 2020 voyage will offer a 111-day round trip sailing from the US, departing either Ft. Lauderdale or Los Angeles (on January 5, 2020 or January 20, 2020). Shorter segments will also be available if you can't be away for almost four months.